Short Term Loans are a Short Term Solution – Do Not Mis-use! Short term loans are not intended to last years or even months. A short term loan is exactly as described. You are supposed to take one out and pay it back as quickly as possible. There is no obligation to do this, but the setup of how they work makes this the obvious intention. The problem is that many people are using short term loans as an extended solution to debt problems or financial issues, rather than the short term solution they are designed to be. Rather than paying them off as quickly as possible, these loans are being stretched out. This can lead to multiple problems that affect the individual’s financial situation as well as the rest of their lives. Let’s look at some of these issues and find out why you want to avoid them. 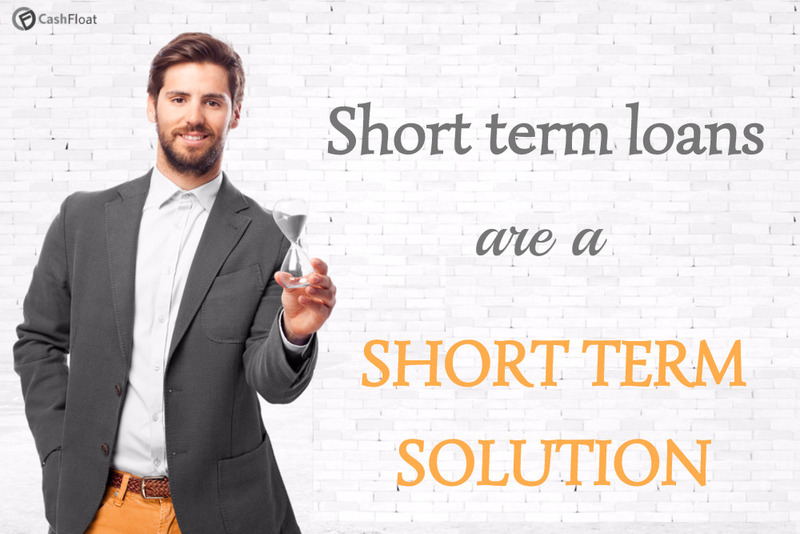 Why are Short term loans a short term solution? Short term loans have high levels of interest. The reason for this is that again; they are supposed to be a fast, short term solution. Therefore, interest levels should be high to encourage people to pay the loan back quickly. With high interest levels, lenders attempt to guarantee that the interest on a loan does not grow out of control. Does this work? It will be ineffective if people borrow more than they can afford. By borrowing more than they can afford individuals fail to pay back the loan on time. Instead, they let the loan lapse and may even borrow more money to pay off the first short term loan. While the first is paid off, they now have a second loan to content with that has a higher level of interest. Some short term loans do arrive with late fees and charges. Again, this intended to encourage borrowers to pay back the money as quickly as possible. If they don’t, lenders can hit them with fees and extra interest that can end up amounting to the same level of money that they initially borrowed, according to the regulations set out by the Financial Conduct Authority (FCA). The borrower may not have even been able to pay the initial loan cost without interest. Thus, it is highly unlikely that they will be able to manage a loan that is now double that amount. The original duration of the loan is typically only one or two months. However, some short term loans are stretched out over several years. The big issue here is that taking out a short term loan and keeping it open causes a debt spiral. The money owed builds, and the borrower may take out more cash to cover the initial loan. Even if the first loan is paid off, the amount owed continues to grow until it becomes insurmountable. The borrower might even stop trying to pay off the loan and instead accept living entirely on credit. Of course, this type of behavior can’t last forever. Eventually, the lender will stop paying out to the borrower. However, they will also claim back the money that the borrower owes. The next issue borrowers will have to contend with is what happens when they fail to pay back the loan. If the loan is not paid back at the right time and the money owed continues to build, loan companies will force repayments. They may do this by directly accessing the account of the borrower and draining any money they have in the account. The paycheck they receive at the end of each month is withdrawn to take care of their debt. They might face repossession and eviction as the lender claims ownership of their property. To do this, lenders might hire collectors. These employees have been known to be incredibly aggressive when getting someone to pay back the money owed. In many cases, it has even led to fairly severe forms of harassment and threats. While not strictly legal, this type of behavior may be tolerated by law enforcement. It can start to feel as there is no one to help you in this situation. By keeping a short term loan on over an extended period, you might reach a point where you are unable to pay basic expenses. This could be food or energy bills, and not just for you. If you have children or a family, they might be reliant on your income as well. Unfortunately, your income is now being devoured by debt that continues to build. The final result is that you may have to file for bankruptcy and start fresh. This is, of course, the worst case scenario. However, you would be surprised how fast relying on a loan could cause you to reach this point. Even if you manage to escape the debt, you will be left with an obliterated credit rating. It will take years to rebuild your credit rating to a healthy level. You might think that a problem with your credit rating isn’t that serious. After all, it only determines whether you can borrow money. But borrowing money can be important. For instance, you might need to borrow to buy a home in the future. It is also worth pointing out there are many other instances when your credit rating is examined. For instance, a landlord may check your credit rating before accepting you as a tenant. An employer might check your credit rating before hiring you for a job, particularly if that job involves the handling of money at any point. The main issue is growing accustomed to using a short term loan as a short term solution for debt. If you are in debt, you should never take out a loan to pay it off. There are other options available here, such as getting help from professional debt advisors. By borrowing more money, you will only be making the situation worse, entering the debt cycle we already talked about. The main point to consider before taking out a loan is whether or not you can afford it. If you already know that you can’t afford to pay it back, you shouldn’t be take it out in the first place. This includes the interest level on top of the loan and any other fees that you might be held to pay. As you can see then, there are severe dangers and consequences of using a short term loan as a long term solution. But, does that mean that short term loans are dangerous in general? There are many instances where a fast payday loan or short term loan could be useful. You might have an expense that needs to be paid quickly. For instance, you may need to repair your car so that you have transportation to get to work each day. In this example, a short term loan will help you keep your job. The benefits of using a short term loan as a short term solution is that you can borrow as much as you can afford. You can then choose how and when you pay it back. If you do this, there’s no reason that the loan needs to build up to a level you can’t afford. The loan can be paid back gradually over a few months, or as quickly as possible. You can even start paying off your loan a week after you take it out, or with your next paycheck. Within a couple of months, the loan could be completely taken care of. As already explained, these loans are designed to be a quick fix, short term solution. By stretching them out, you are putting yourself in a dangerous situation. You will experience a high level of debt over a long period. This can be avoided by using short term loans as they were intended. Elizabeth Redfern is a born and bred Londoner who loves the city life. She is a proud chocoholic who enjoys reading, jogging and eating - especially chocolate! Elizabeth attained a first class degree in Mathematics but chose to make a career out of her real passion, writing. She has published many poems and short stories, but decided to join the Cashfloat educational channel writing team because she is passionate about helping people take care of their finances leaving them free to enjoy the finer points of life - most notably (in her opinion), chocolate! How Good are Your Financial Skills?